Cross section of the retina. In the right half of the drawing, a single cone cell in the center is surrounded by rod cells above and below it. Morphology Long and narrow with cone shaped end portion. 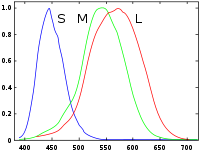 Normalized responsivity spectra of human cone cells, S(short), M(medium), and L(long) types. Vertical axis: Responsivity. Horizontal axis: Wavelength in nanometers. A cone cell, or cone, is any of the photoreceptor cells in the retina of the eye that function best in relatively bright light and allow color vision, with greater visual acuity than that of the other type of photoreceptor, rod cells, which are more sensitive to dim light and lack color-distinguishing ability. Whereas rod cells are responsible for night vision in humans and predominate in nocturnal vertebrates, cone cells are adapted more for vision during the bright light of day under which they facilitate color perception and the visual detection of finer detail and more rapid changes in images than are provided by rod cells. The color vision capability of humans depends on the brain's ability to construct colors based on its receiving nerve signals from three types of cones, each sensitive to a different range of the visual spectrum of light as determined by the type of photopsin (a photoreceptor complex comprising a protein bound to a light-responsive molecule) within it. The three types of photopsin—and the three types of cone cells—respond to variation in color in different ways and make possible trichromatic vision. However, some vertebrates are reported to have four types of cones, giving them tretrachromatic vision. Partial or complete loss of function of one or more of the different cone systems can cause color blindness. The system of cones and rods offers a complementary system in humans, allowing one to see in both dim light (rods) and to see a diversity of colors in brighter light (cones). Cones allow humans to experience the great beauty that color adds, whether a flower in nature, an abstract painting, or the color of one's eyes. Although there are only three standard color-detecting cones in the human retina, the various gradations of colors afforded by these, combined with the brain's ability to combine these variations exponentially, is said to allow the average person to distinguish about one million different hues (Roth 2006). The retina contains two forms of photosensitive cells—rods and cones. Though structurally and metabolically similar, their function is quite different. Rod cells are highly sensitive to light, allowing them to respond in dim light and dark conditions. These are the cells that allow humans and other animals to see by moonlight, or with very little available light (as in a dark room). However, they do not distinguish between colors, and have low visual acuity (measure of detail). This is why the darker conditions become, the less color objects seem to have. Cone cells, conversely, need high light intensities to respond and have high visual acuity. Different cone cells respond to different colors (wavelengths of light), which allows an organism to see color. Rods and cones are both photosensitive, but respond differently to different frequencies of light because they contain a different photoreceptor complex. Rod cells contain the protein-chromophore complex, rhodopsin, and cone cells contain different protein-chromophore complexes, photopsins, for each color range. The process through which these complexes work is quite similar—upon being subjected to electromagnetic radiation of a particular wavelength and intensity, the chromophore, called retinal, undergoes a structural change that destabilizes the complex causing the protein, an opsin, to pass through a series of changes that concludes with the complex separating into separate retinal and opsin units. Rhodopsin, of rods, breaks down into retinal and opsin; the three photopsins of cones breaks down into retinal and three different opsins. All of the different opsins trigger a change in the membrane protein transducin, which in turn activates the enzyme phosphodiesterase, which catalyzes a molecular change that causes sodium ion channels in the cell membrane to close. This leads to the generation of an action potential (an impulse that will eventually reach the visual cortex in the brain). This is the reason why cones and rods enable organisms to see in dark and light conditions—each of the photoreceptor complexes requires a different light intensity to break down into its components. Further, signals from hundreds or thousands of rod cells are combined and transmitted to the visual cortex through a single bipolar cell connected to a single ganglion cell leading to the brain. On the other hand, a single cone cell is connected to a single bipolar cell. Thus, action potentials from rods share neurons, whereas those from cones are given their own. This results in the high visual acuity, or the high ability to distinguish between detail, of cone cells and not rods. The ability to differentiate colors depends on the electromagnetic wavelength sensitivity of the three types of photopsin in the three types of cone cells with primary sensitivity of red, green, or blue light. If all three forms of cones are stimulated equally, then white is seen. If none are stimulated, black is seen. Most of the time however, the three forms are stimulated to different extents—resulting in different colors being seen. If, for example, the red and green cones are stimulated to the same extent, and no blue cones are stimulated, yellow is seen. For this reason red, green, and blue are called primary colors and the colors obtained by mixing two of them, secondary colors. The secondary colors can be further complimented with primary colors to see tertiary colors. In humans, the fovea, directly behind the lens, consists mostly of densely-packed cone cells. The cone cells gradually become more sparse toward the periphery of the retina. This gives humans a highly detailed central vision, allowing reading, bird watching, or any other task that primarily requires looking at things. Its requirement for high intensity light does cause problems for astronomers, as they cannot see dim stars, or other objects, using central vision because the light from these is not enough to stimulate cone cells. Because cone cells are all that exist directly in the fovea, astronomers have to look at stars through the "corner of their eyes" (averted vision) where rods also exist, and where the light can stimulate cells, allowing the individual to observe distant stars. A commonly cited figure for the number of cones in the eye is six million, established by Osterberg (1935). Oyster (1999) cites evidence for an average closer to 4.5 million cone cells and 90 million rod cells in the human retina. Humans normally have three kinds of cones. The first responds most to light of long wavelengths, peaking in the yellow region; this type is designated L for "long." The second type responds most to light of medium-wavelength, peaking at green, and is abbreviated M for "medium." The third type responds most to short-wavelength light, of a violet color, and is designated S for "short." The three types have peak wavelengths near 564–580 nm, 534–545 nm, and 420–440 nm, respectively (Wyszecki and Stiles 1982; Hunt 2004). The difference in the signals received from the three cone types allows the brain to perceive all possible colors, through the opponent process of color vision. The color yellow, for example, is perceived when the L cones are stimulated slightly more than the M cones, and the color red is perceived when the L cones are stimulated significantly more than the M cones. Similarly, blue and violet hues are perceived when the S receptor is stimulated more than the other two. The S cones are most sensitive to light at wavelengths around 420 nm. However, the lens and cornea of the human eye are increasingly absorbative to smaller wavelengths, and this sets the lower wavelength limit of human-visible light to approximately 380 nm, which is therefore called "ultraviolet" light. People with aphakia, a condition where the eye lacks a lens, sometimes report the ability to see into the ultraviolet range (Hambling 2002). At moderate to bright light levels where the cones function, the eye is more sensitive to yellowish-green light than other colors because this stimulates the two most common of the three kinds of cones almost equally. At lower light levels, where only the rod cells function, the sensitivity is greatest at a blueish-green wavelength. The light-sensing part of cone cells is somewhat shorter than the light sensing part of rod cells, but wider and tapered. Cone cells are much less numerous than rods in most parts of the retina, but greatly outnumber rods in the fovea. Structurally, cone cells have a cone-like shape in their light-sensing part where a pigment filters incoming light, giving cone cells their different response curves. They are typically 40-50 µm long, and their diameter varies from .50 to 4.0 µm, being smallest and most tightly packed at the center of the eye at the fovea. The S cones are a little larger than the others. Photobleaching can be used to determine cone arrangement. This is done by exposing dark-adapted retina to a certain wavelength of light that paralyzes cones sensitive to that wavelength for up to thirty minutes rendering them unable to dark-adapt. As a result, the paralyzed cones appear white in contrast to the gray dark-adapted cones when a picture of the retina is taken. The results illustrate that S cones are randomly placed and appear much less frequently than the M and L cones. The ratio of M and L cones varies greatly among different people with regular vision (Roorda and Williams 1999). Like rod cells, cone cells are long and narrow with a synaptic terminal, an inner segment, and an outer segment, as well as an interior nucleus and various mitochondria. The synaptic terminal forms a synapse with a neuron such as a bipolar cell. The inner and outer segments are connected by a cilium (Kandel et al. 2000). The inner segment contains organelles and the cell's nucleus, while the outer segment, which is pointed toward the back of the eye, contains the light-absorbing materials (Kendel et al. 2000). Like rods, the outer segments of cones have invaginations of their cell membranes that create stacks of membranous disks. Photopigments exist as transmembrane proteins within these disks, which provide more surface area for light to affect the pigments. In cones, these disks are attached to the outer membrane, whereas they are pinched off and exist separately in rods. Neither rods nor cones divide, but their membranous disks wear out and are worn off at the end of the outer segment, to be consumed and recycled by phagocytic cells. Activation of a photoreceptor cell is actually a hyperpolarization (inhibition) of the cell. When they are not being stimulated, such as in the dark, rods and cones depolarize and release a neurotransmitter spontaneously. This neurotransmitter hyperpolarizes the bipolar cell. Bipolar cells exist between photoreceptors and ganglion cells and act to transmit signals from the photoreceptors to the ganglion cells. As a result of the bipolar cell being hyperpolarized, it does not release its transmitter at the bipolar-ganglion synapse and the synapse is not excited. Activation of photopigments by light sends a signal by hyperpolarizing the cone cell, leading to the cone cell not sending its neurotransmitter, which leads to the bipolar cell then releasing its transmitter at the bipolar-ganglion synapse and exciting the synapse. Depolarization occurs due to the fact that in the dark, cells have a relatively high concentration of cyclic guanosine 3'-5' monophosphate (cGMP), which opens ion channels (largely sodium channels, though calcium can enter through these channels as well). The positive charges of the ions that enter the cell down its electrochemical gradient change the cell's membrane potential, cause depolarization, and lead to the release of the neurotransmitter glutamate. Glutamate can depolarize some neurons and hyperpolarize others, allowing photoreceptors to interact in an antagonistic manner. When light hits photoreceptive pigments within the photoreceptor cell, the pigment changes shape. The pigment, called photopsin (rhodopsin is found in rod cells) consists of a large protein called opsin (situated in the plasma membrane), attached to which is a covalently-bound prosthetic group: An organic molecule called retinal (a derivative of vitamin A). The retinal exists in the 11-cis-retinal form when in the dark, and stimulation by light causes its structure to change to all-trans-retinal. This structural change causes a structural change in the opsin, which in turn activates a regulatory protein called transducin, which leads to the activation of cGMP phosphodiesterase, which breaks cGMP down into 5'-GMP. Reduction in cGMP allows the ion channels to close, preventing the influx of positive ions, hyperpolarizing the cell, and stopping the release of neurotransmitters (Kandel et al. 2000). Though cone cells primarily use the neurotransmitter substance acetylcholine, rod cells use a variety of neurotransmitters. The entire process by which light initiates a sensory response is called visual phototransduction. The response of cone cells to light is also directionally nonuniform, peaking at a direction that delivers light to the center of the pupil; this effect is known as the Stiles–Crawford effect. Tetrachromacy is the condition of possessing four independent channels for conveying color information, or possessing four different cones. Organisms with tetrachromacy are called tetrachromats. For these organisms, the perceptual effect of any arbitrarily chosen light from its visible spectrum can be matched by a mixture of no fewer than four different pure spectral lights. The normal explanation of tetrachromacy is that the organism's retina contains four types of cone cells with different absorption spectra. This means the animal may see wavelengths beyond those of a typical human being's eyesight, and may be able to distinguish colors that to a human are identical. The zebrafish (Danio rerio) is an example of a tetrachromat, containing cone cells sensitive for red, green, blue, and ultraviolet light (Robinson et al. 1993). Tetrachromacy is expected to occur in several species of birds, fish, amphibians, reptiles, arachnids, and insects. Humans and closely related primates normally have three types of cone cells and are therefore trichromats (animals with three different cones). However, it has been suggested that women who are carriers for variant cone pigments might be born as tetrachromats, having four different simultaneously functioning kinds of cones to pick up different colors (Jameson et al. 2001). One study suggested that 2–3 percent of the world's women might have the kind of fourth cone that lies between the standard red and green cones, giving, theoretically, a significant increase in color differentiation (Roth 2006). However, another study suggests that as many as 50 percent of women and 8 percent of men may have four photopigments (Jameson 2001). Further studies will need to be conducted to verify tetrachromacy in humans. Hambling, D. 2002. Let the light shine in: You don't have to come from another planet to see ultraviolet light. The Guardian May 30,2002. Retrieved May 18, 2008. Hunt, R. W. G. 2004. The Reproduction of Colour. Chichester, UK: Wiley–IS&T Series in Imaging Science and Technology. ISBN 0470024259. Jameson, K. A., S. M. Highnote, and L. M. Wasserman. 2001. Richer color experience in observers with multiple photopigment opsin genes. Psychonomic Bulletin and Review 8(2): 244–261. PMID 11495112. Retrieved May 18, 2008. Kandel, E. R., J. H. Schwartz, and T. M. Jessell. 2000. Principles of Neural Science, 4th edition. New York: McGraw-Hill. ISBN 0071120009. Robinson, J., E. A. Schmitt, F.I. Harosi, R. J. Reece, and J. E. Dowling. 1993. Zebrafish ultraviolet visual pigment: Absorption spectrum, sequence, and localization. Proc. Natl. Acad. Sci. U.S.A. 90: 6009–6012. Roorda, A., and D. R. Williams. 1999. The arrangement of the three cone classes in the living human eye. Nature 397: 520-522. Roth, M. 2006. Some women may see 100,000,000 colors, thanks to their genes. Pittsburgh Post-Gazette September 13, 2006. Retrieved May 18, 2008. Wyszecki, G., and W. S. Stiles. 1982. Color Science: Concepts and Methods, Quantitative Data and Formulae. New York: Wiley Series in Pure and Applied Optics. ISBN 0471021067. This page was last modified on 4 September 2008, at 20:25.